Did you know that in Milan, unlike the more southern parts of Italy, tomatoes are rarely used! When we heard this our worlds were turned upside down somewhat. So, here’s our Turkey Milanese. It’s creamy and it’s herby – so it’s perfect for those winter evenings. Dig in! Pre-heat your oven to 180 degrees. 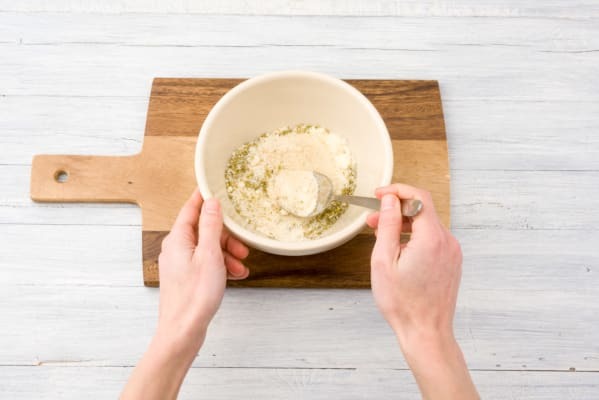 LH: Grate the parmesan and pop it in in a large mixing bowl. Now add the breadcrumbs, garlic salt, dried basil, dried oregano and a really good grind of black pepper and stir to combine. Bring a large pot of water to the boil with ½ tsp of salt. Peel and roughly chop your potatoes into 3cm chunks. Pop the potatoes into the pot of boiling water and boil for about 15 mins until tender. Tip: The potatoes are cooked when you can easily slip a knife through them. In the meantime, prepare your turkey! 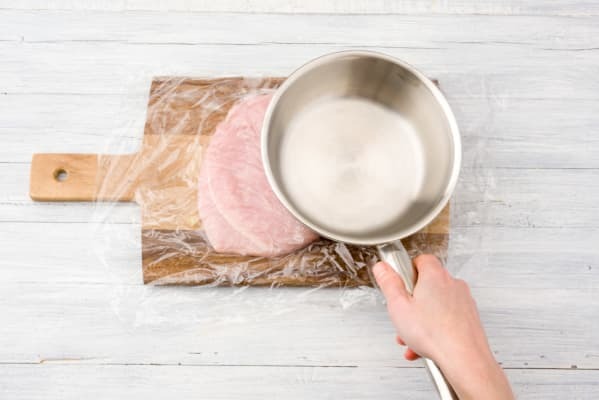 Put your turkey steaks in between two sheets of clingfilm and use the back of a frying pan to bash the steaks, until they are no more than 1cm thick throughout. Using your hands, rub each steak with 3/4 tbsp of crème fraîche (keep a little back for the mashed potato!) and roll it in the bowl of cheesy-breadcrumb topping until fully coated. 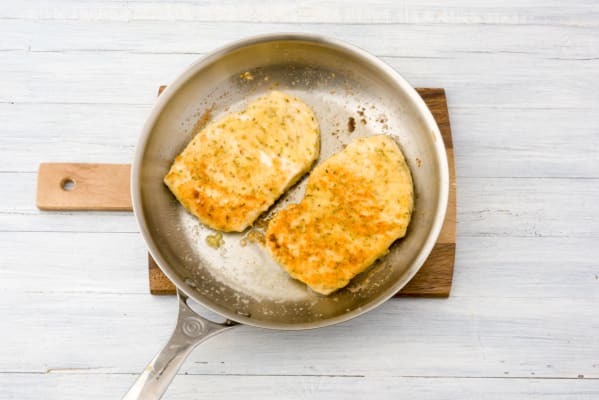 Heat 2 tbsp of oil in a large frying pan on medium heat and fry the steaks for 3 mins on each side, until golden brown. Transfer the steaks to a non-stick ovenproof dish and bake for 12-15 mins. Tip: The turkey is cooked when it is no longer pink in the middle! While the turkey is baking we can return to the veggies! Bring another pot of water to the boil with 1/2 tsp of salt on medium heat. Cut the ends off your green beans. Tip: This is called topping and tailing your green beans. Pop the beans into the boiling water and gently simmer for 5 mins. 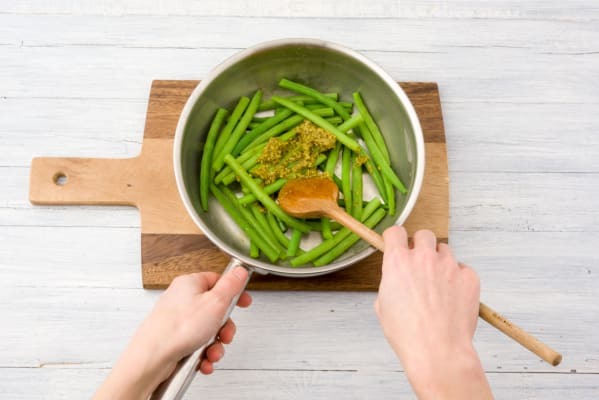 When cooked, drain and return to the empty pot and set over very low heat, whilst gently stirring in the pesto and a good grind of black pepper, for a minute. Your potatoes should now be ready. Drain, return to the empty pot and set over very low heat for 1 minute, to completely dry out. Remove from the heat and carefully fold in the remaining crème fraîche along with 5 tbsp of milk and 2 tbsp of butter (if you have it), 1 tsp salt and a few good grinds of black pepper and mash until everything is nice and smooth. Cover until everything else is ready. 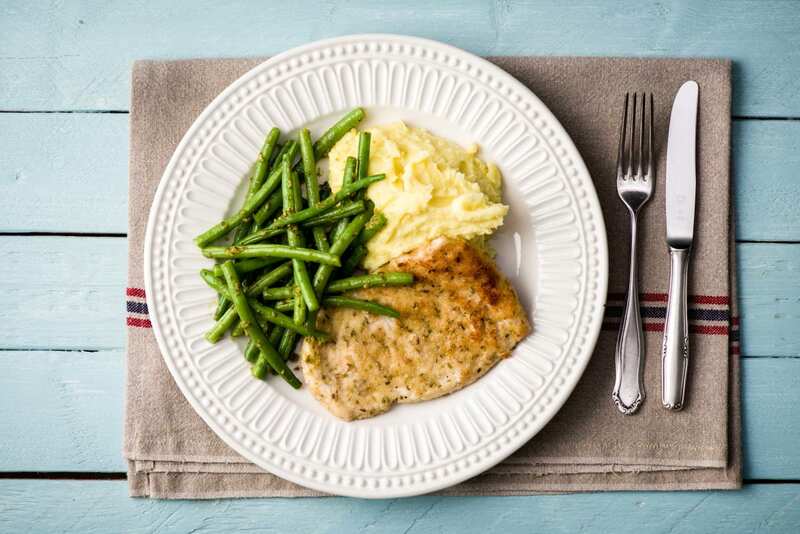 Serve your turkey milanese on a plate, together with a dollop of creamy mashed potatoes and pesto-licious green beans!